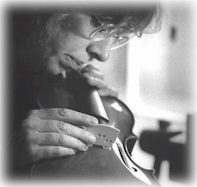 Rowan is remembered for her skill, integrity and generosity both as a violin maker and a teacher and for her contribution to raising the standards of violin making in Britain. 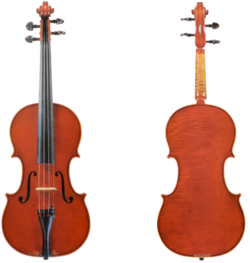 She trained under Giobatta Morassi at the International Violin Making School in Cremona, graduating in 1975, and then spent a period with Gil Solomon in Britain as a restorer. For the next 20 years, she had her own workshop producing approximately 120 new instruments, which are now in the hands of players all around the world. Her work as a teacher – both of those who were making for sheer pleasure and of those who intended to become professional makers – was also important. For many years she taught at the summer schools at Loughborough and Cambridge and ran an evening class in Leamington Spa. She was also a lecturer at the Newark School of Violin Making for five years. Her work was exhibited and won awards at various festivals and exhibitions. Above all her instruments were played – and surely will continue to be for generations to come. reproduced with kind permission from the BVMA/Clarissa Bruce.